*Alma Mater Professor of Physical Chemistry at University of Bologna, Italy. 1972, Laurea in Chimica Industriale, University of Bologna, Italy (110/110 with lode and M. Betti Prize). Supervisor: Prof. G.F. Pedulli. 1975, Ph.D. in Chemical Physics, University of Southampton (U.K.). Thesis: On the molecular theories of liquid crystals. 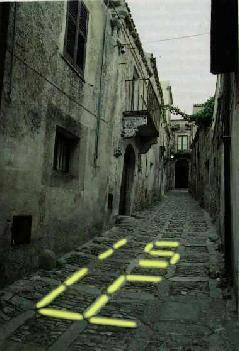 Supervisor: Prof. G.R. Luckhurst. 1979-80, 1980-81, 1981-82, Visiting Lecturer, ``Liquid Crystals and Liquids" course, Department of Chemistry, University of Southampton, UK. 2004, Awarded Sturgeon Lecture of the British Liquid Crystal Society, Manchester. 2009-2010, appointed visiting Adjunt Professor; 2012-2014, appointed visiting Chair Professor, Centre for Modelling Simulation and Design (CMSD), University of Hyderabad, India. September 2010, Awarded G.B. Bonino medal of the Italian Chemical Society- Physical Chemistry Division. August 2015, "Academic Icon" Visiting Professor, University of Malaya, Kuala Lumpur, Malaysia. February 2018, Solvay Colloquium Lecturer, ULB, Bruxelles. 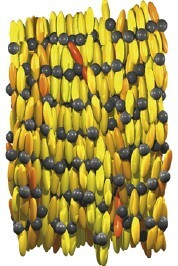 Computer Simulations and Modeling (Monte Carlo, Molecular Dynamics) of lattice (Lebwohl-Lasher), molecular (Gay-Berne) and atomistic models as well as Statistical Theories of bulk and confined Liquid Crystals. 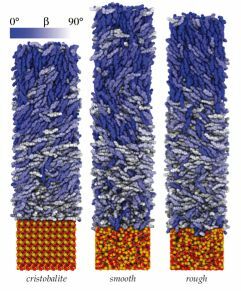 Gay-Berne (GB) systems are molecular resolution models employed to study various liquid crystal phases and their transitions. 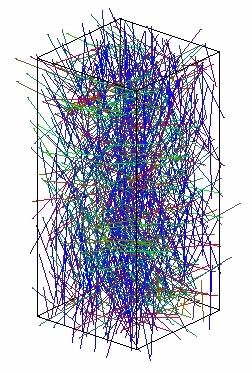 In particular computer simulations of nematics and of their nematic-isotropic and nematic-vapour alignment properties have been performed. 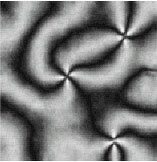 The molecular organization near surfaces, for instance near a chiral wall or near a graphite surface is investigated. 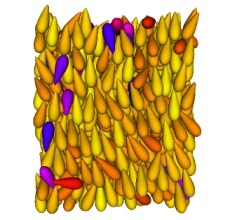 Modeling of the macroscopic liquid crystal properties resulting by simple changes in the molecular structure, particularly due to the effect of permanent dipoles are studied in smectics, where the dipole position in the molecule is shown to influence profoundly the phases obtained, even with domain formation and in columnar systems . We have also studied flexoelectric effects for pear shaped GB molecules . Modelling of novel mesophases. We have developed generalized versions of the GB potential that allow non-uniaxial and non-symmetric shapes. Using these models we have succeeded in simulating thermotropic biaxial nematics and a ferroelectric nematic designed from tapered molecules by suitably combining repulsive and attractive interactions. Fullerene mesogens have been studied combining GB and Girifalco potentials, with the aim of investigating morphologies promising for efficient carrier transport in organic photovoltaics. Modelling of Liquid Crystal Polymers. We have extended the GB model further to model LC polymers with anisotropic beads and springs in bulk and nanoconfined systems.We have developed soft GB potentials that have allowed the off-lattice simulation of swollen liquid crystals elastomers (LCE) and actuators. 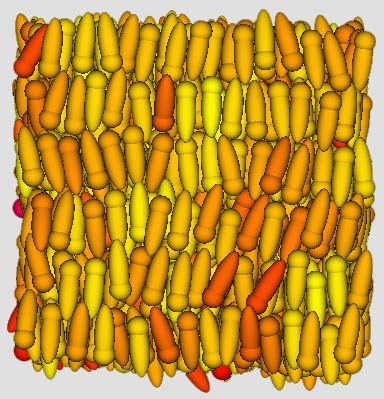 Atomistic simulations of Liquid Crystals. We model geometry and charge distribution of liquid crystal (LC) molecules using Quantum Chemistry techniques and we simulate and predict, using Molecular Dynamics, their properties and phase transitions. We have succeeded in obtaining LC phase transition temperatures and in reproducing the odd-even effect, i.e. the large alternation in mesophase transition temperatures and properties shown by many homologous series of liquid crystals containing (CH2)n chains when varying the parity of n. . We have also succeeded in simulating the nematic-isotropic transition temperature and the properties of n-cyanobiphenyls (nCB, n=5,6,7,8),sexithiophene T6 and other liquid crystals. 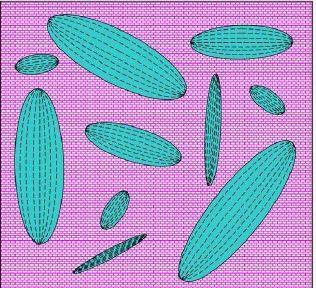 Atomistic simulations of alignment and anchoring of organic functional materials and liquid crystals on surfaces. We have investigated the alignment of liquid crystals close to a surface, like crystalline silicon and silica both crystalline and glassy and we are now studying other interfaces. 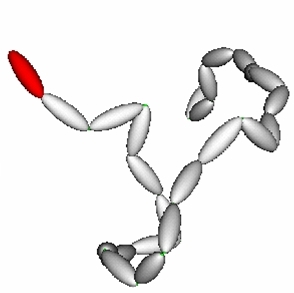 Maximum entropy techniques are developed to extract conformational information on flexible molecules, mainly from NMR data. An analysis of Fluorescence polarization using a theory of rotational diffusion for biaxial molecules has been applied to molecules as complex as Chlorophyll a in nematics to derive its order parameters and diffusion coefficients. A theory for rotational-translational diffusion for biaxial molecules in uniaxial phases has been developed. Energy Transfer experiments are modeled using computer simulations for rodlike and discotic systems with an aim to asses the effect of phase organization on the efficiency and directionality of Forster transfer. 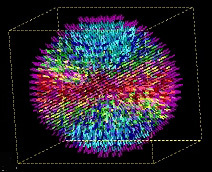 Experimental ESR spin probe studies are used to study order and dynamics in various complex systems,e.g. 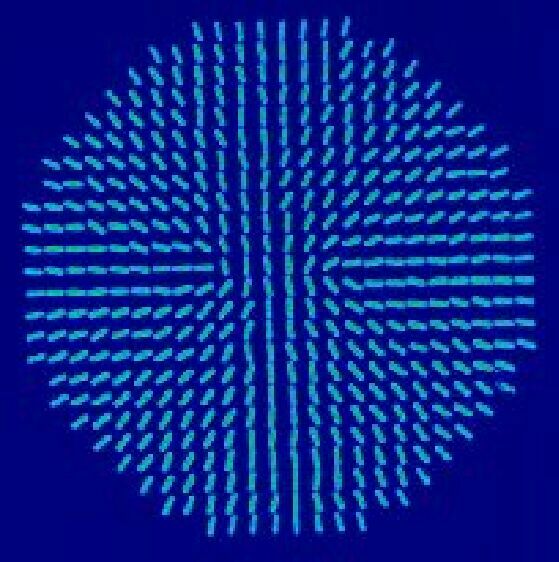 nematics with dispersed aerosils or nanodroplets in holographic polymer dispersed liquid crystals (HPDLC). C.Z. has given more than 300 invited talks in a number of Universities and Research Institutions including: Yerevan (Armenia); Graz (Austria); Brussels, Leuven, Mons (Belgium); Aguas de Lindoia, Foz do Iguaçu, Maceiò (Brazil), NRC, Ottawa, UBC, Vancouver (Canada); Xiamen, Fudan-Shangai, Beihang -Beijing (China); Tampere (Finland), Bandol, Bordeaux, Cergy-Pontoise, Lyon, Orsay, Paris, Sete, Strasburg (France); Berlin, Bremen, Juelich, Kaiserslautern, Mainz, Stuttgart (Germany); Corfu, Rhodes (Greece); Budapest (Hungary); Hyderabad (India); Dublin (Ireland); Bologna, Cagliari, Calabria, Camerino, Cetraro, Erice, Ferrara, Firenze, Genova, Milano, Modena, Novara, Padova, Palermo, Parma, Pavia, Perugia, Pisa, Portonovo (AN), Ravenna, Rimini, Roma, Rovereto, Salerno, Torino, Trento, Trieste, Tropea, Urbino, Venezia (Italy); Kyoto, Nagoya, Nara, Osaka, Sendai, Tokyo, Tsu (Japan); Jeju, Seoul (Korea); Luxembourg (Luxembourg), Kuala Lumpur (Malaysia), Trondheim (Norway); Krakow, Torun (Poland); Lisbon (Portugal); Moscow (Russia), Ljubljana, Maribor, Portoroz, Rogaska-Slatina (Slovenia); Elche, Peñíscola, Zaragoza (Spain); Stockholm (Sweden); Lausanne-EPFL, Lugano, Zurich-ETH (Switzerland); Hsinchu, Tamsui-Taipei, Taichung (Taiwan) ; Enschede, Groningen, Leiden, Utrecht (The Netherlands); Belfast, Bristol, Cambridge, Durham, Edinburgh, London, Manchester, Norwich, Oxford, Sheffield, Southampton, York, Warwick (UK); Atlanta (GA), Biddeford (ME), Boston - ACS (MA), Breckenridge (CO), Courant Institute - New York (NY), Kent State (OH), Mount Holyoke (MA), IMA, Minneapolis (MN), Penn State (PA), Princeton (NJ), San Diego (CA), Colby-Sawyer, Tilton (NH); Washington (DC)- NIST (USA). (Click here for a list of talks). Editorial Advisory Board of Molecular Crystals Liquid Crystals, USA (1996- ). 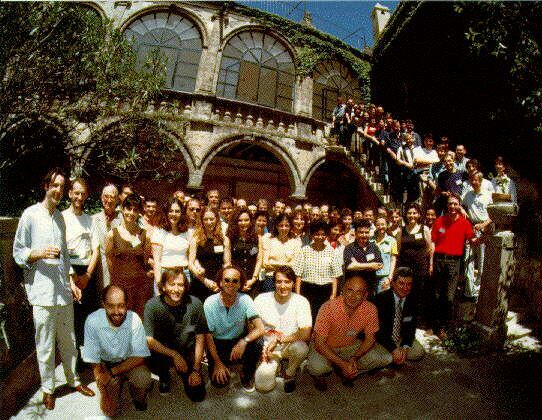 Director of the International School of Liquid Crystals (ISLC), at the Centro Ettore Majorana, Erice , since 1998 (click here for a booklet with information for participants and a few photographs). .A total of 25 courses have been completed within ISLC at Oct. 2018. President of the International (ILCS) Liquid Crystal Society (Aug 2012-July 2016), has been on the Board of ILCS as representative for Italy (July 2000-2012). Member of the European Science Foundation (ESF) Pool of Reviewers (May 2006-April 2012), of the EPSRC Peer Review College (2006-) and reviewer for a number of Institutions, including Belgian BELSPO and the Royal Swedish Academy of Sciences. Chairman of CINECA Scientific Committee for PRACE (2012-2016). Member of the Chemistry Panel of Experts of the European Community, Human Capital and Mobility project (1992-1994). Member of the Fellowships and of the Networks Chemistry Review Panels for the Training and Mobility of Researchers Program (1995, 2001). 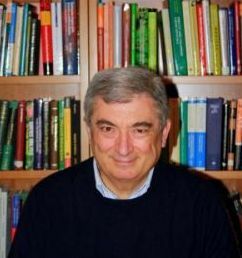 Member of the Scientific Board of the "Istituto dei composti del carbonio contenenti eteroatomi e loro applicazioni" (ICOCEA) CNR, Bologna (1997-2000) and of the "Centro Studi CNR sugli Stati Molecolari Radicalici ed Eccitati" (CSSMRE), Padova (1997-2000). Member of the INFM Evaluation Panel (2000). Member of the International Advisory Board of the Southampton Liquid Crystal Institute (1996-2003). External Member of the INFM (National Institute for the Physics of Matter) Directors Board ("Consiglio Direttivo") (2001-2003). Director of the Theory Section of INSTM , the Italian Consortium for Science and Technology of Materials (Florence) (formerly INCM 1993-1996) and member of its Scientific Council (1996-March 2009). Coordinator of the National "Virtual" Computational Laboratory of INSTM at CINECA computing centre providing supercomputer and general computing resources and access to selected scientific software to INSTM members (1997- 2009). Chairman of the Scientific Users Selection Panel (SUSP) panel for the High Performance Computing Centres Access programme: HPC-Europa (2004-2012) . 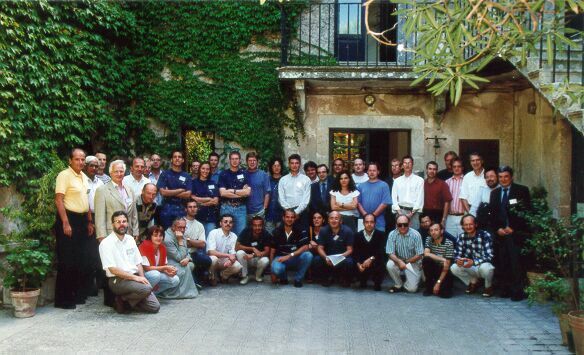 Director with Dr. P. Pasini (INFN, Bologna) of the NATO ASI: Advances in the Computer Simulation of Liquid Crystals, Erice, Italy, 11-21 June 1998 (click here for a group photo of the participants) and with P. Pasini and S. Zumer of the NATO ARW "Computer simulations of defects in liquid crystals including their relation to theory and experiment" , Erice 19-23 September 2000. MURST national project (PRIN) Cristalli liquidi: Struttura, Simulazioni al Calcolatore, Proprietà ed Applicazioni (1997-1999), Coordinator. MURST national project (PRIN) Struttura, Ordine, Dinamica e Applicazioni di Sistemi Liquido Cristallini,( 2000-2001) Coordinator . MIUR national project (PRIN) Liquid crystals and macromolecules for nano-organised structures (Cristalli liquidi e macromolecole per strutture nano-organizzate) (2004-2005), Coordinator. 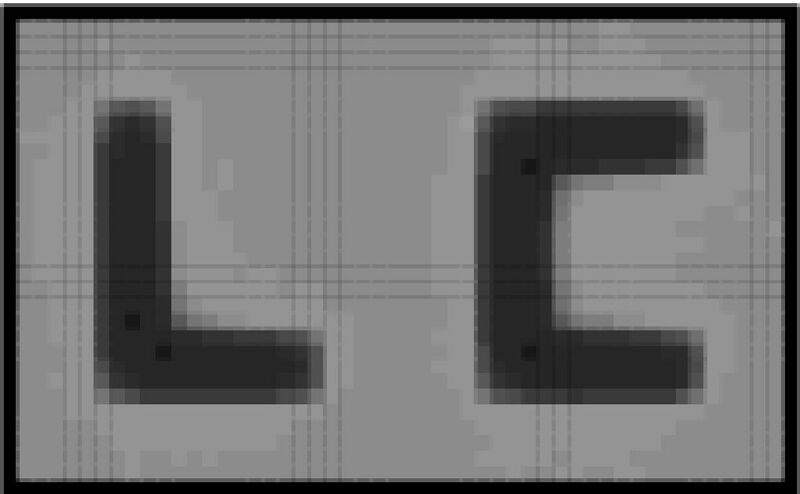 INSTM-PRISMA project: Prediction of Dielectric Properties of Liquid Crystalline Materials for Display and Photonic Applications (Previsione di proprieta` dielettriche di materiali liquido-cristallini per display e applicazioni fotoniche ), coordinator Prof. G.J. Moro (Padova), (Sep. 2004- Sep.2005). MUR national project (PRIN) Modelling and characterisation of liquid crystals for nano-organised structures (Modellizzazione e caratterizzazione di cristalli liquidi per strutture nano-organizzate) #2005035119 (2006-2007).Coordinator. Modelling and Computer Simulations to the FIRB project "Protein Folding and Aggregation: Metals and Biomolecules in Protein Conformational Diseases" RBNE03PX83, coordinated by Prof. E. Rizzarelli (Catania). (2004-2007). Collaborator. National FIRB project on Nanotechnology ("Nanotecnologie, microtecnologie, sviluppo integrato dei materiali"): Molecular and organic/inorganic hybrid nanostructures for photonics (Nanostrutture molecolari e ibride organiche/inorganiche per fotonica) RBNE01P4JF (2003-2007): National Coordinator Prof. R. Bozio (Padova). Coordinator of WP1: Theoretical and Computational Modelling (Modellazione teorica e simulazione). “Laboratorio di Nanofabbricazione per l’ Emilia Romagna (NANOFABER)” Project, "Programma Regionale per la Ricerca industriale, l’Innovazione e il Trasferimento tecnologico (PRRIITT)" (19 July 2005 - 19 July 2007+6 months) coordinated by Prof. C. Taliani (CNR, ISMN, Bologna). Participant. Regional Project “PROMINER” ,(Progetto per le Micro e Nano Tecnologie in Emilia Romagna), "Programma Regionale per la Ricerca industriale, l’Innovazione e il Trasferimento tecnologico (PRRIITT)" (Dec.2008-2010): IMM-CNR, ISMN-CNR , ISOF-CNR (Bologna), INFM-CNR S3Modena, IMEM-CNR Parma, DEIS-UniBO, DCFI-UniBO, CIAM-UniBO (Bologna), FIS-UniFE, ING-UniFE (Ferrara), PaRMa-UniPR Parma, CGS Bologna, DEMOCENTER-SIPE Modena, SACMI Imola-BO, OS Bologna, MEDICA Medolla-MO, TECNA Parma, RIAL Parma, coordinated by Prof. M. Bianconi (CNR, ImM, Bologna). Participant. MIUR PRIN national project: Novel ordered systems for high response molecular devices (Simulazioni al calcolatore e indagini sperimentali di sistemi molecolari ad elevata risposta) with Univ. Bologna ( Giampiero Spada until his sad disappearance in Feb. 2013, and then Stefano Masiero), UNICAL (Giorgio Celebre), Pavia (Epifanio Virga) , (17 Oct 2011-16 Oct 2013), Coordinator. EU HCM Network, Molecular Organisation in Liquid Crystals Resulting from Particular Intermolecular Interactions, (CHRX-CT93-0161) coordinated by Prof. D. Dunmur (Sheffield) with groups from Berlin (K. Praecke), Bilbao (M.A. Perez-Jubindo), Bologna (C.Z. ), Grenoble (P. Maldivi), Ivanovo (N. Usoltseva), Krakow (L. Longa), Moscow (M. Osipov), Patras (D. Photinos), Pisa (S. Faetti), Sheffield (D. Dunmur), Southampton (G.R. Luckhurst), Strasbourg (D. Guillon), Zaragoza (J.L. Serrano) (1993-1997). EU HCM Network, Organization and Dynamics of Molecules in Ordered Phases: Integration of Experiments, Theoretical Models and Simulations, (CHRX-CT93-0282) coordinated by Prof. P.L. Nordio (Padova) (1993-1997) with groups from Bologna (C.Z. ), Firenze (R. Righini), Southampton (G.R. Luckhurst), Bristol (R. Richardson), Stuttgart (G. Kothe), Utrecht (Y. Levine), Sevilla (L.F. Rull). 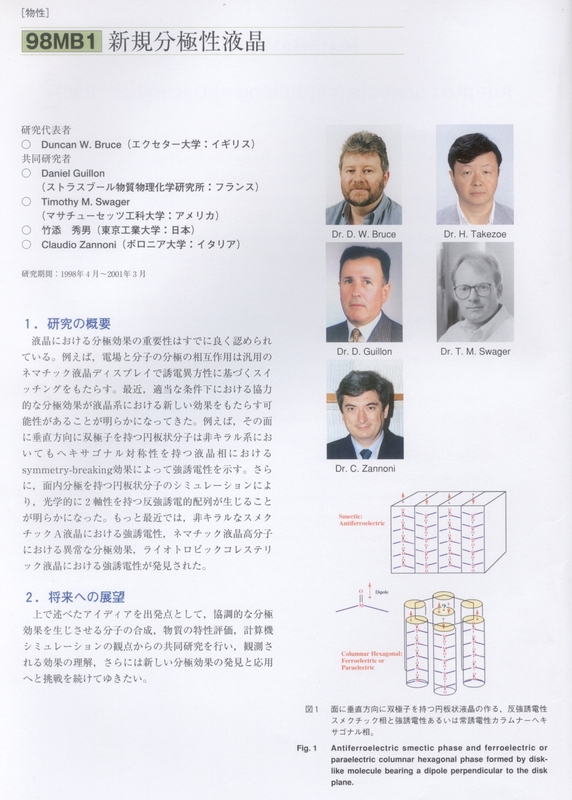 NEDO (Japan) network New Dipolar Liquid Crystals : Synthesis, Simulation and Switching coordinated by Prof. D. Bruce (Exeter), with Profs. D. Guillon (Strasbourg), T.M. Swager (MIT), H. Takezoe (Tokyo Institute of Technology.) (1998-2001). EU TMR Network Functional Liquid Crystalline Elastomers FULCE (HPRN-CT-2002-00169) coordinated by Prof. H. Finkelmann (Freiburg) with groups from Universities of Strasbourg (D. Guillon), Barcelona (D. Velasco), Exeter (D. Bruce), Ljubljana (S. Zumer), Ilmenau (2002- August 2006). FULCE network meeting Ravenna 19-21 Feb2004 . India-Italy Bilateral ST MAE Materials Science & Technology project: Computer simulations of confined liquid crystals with Prof. V.S.S. Sastry, Dept. of Physics, University of Hyderabad (2005-2007) . 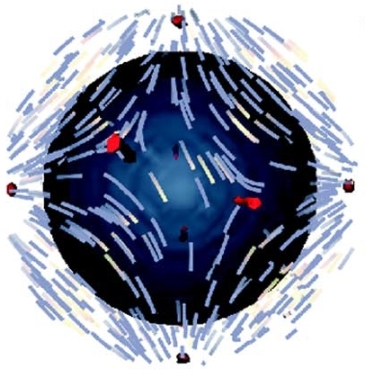 EU Integrated Project “NAnoscale Integrated processing of self-organizing Multifunctional Organic materials” (NAIMO) IP 500355 (2004-2008), coordinator Prof. Yves Geerts (ULB, Brussels). Coordinator of WP7 (training) and of the University of Bologna Unit. Slovenia-Italy Bilateral ST MAE, project F9: Lattice Simulations of Liquid Crystal Elastomers with Prof. Slobodan Zumer, Dept. of Physics, University of Ljubljana (2006-2009). EU FP7 Integrated Project Organic nanomaterials for Electronics and Photonics (ONE-P): IP 212311 (Jan. 2009-Dec 2011), The ONE-P project is coordinated by Prof. Yves Geerts (ULB, Brussels) and comprises Université de Mons Hainaut, Mons, BE ; University of Cambridge, UK; CSIC , Bellaterra, Spain ; Max Planck, Mainz, Germany; CNR ISMN, Bologna, Italy; University of Copenhagen, Denmark; Linköpings Universitet, Sweden; Chalmers University of Technology, Goeteborg, Sweden; IMEC, Leuven, Belgium; Rijksuniversiteit, Groningen, The Netherlands; Westfaelische-Wilhelms Universitaet Muenster, Germany; TNO, Delft, The Netherlands; Université Louis Pasteur, Strasbourg, France; Bergische Universität Wuppertal, Germany; University of Nova Gorica, Adjovscina, Slovenia ; UCL, London, UK; Queen Mary and Westfield College,London, UK; Technische Universität , Dresden, Germany; Philips Electronics, Eindhoven, The Netherlands; STMicroelectronics, Agrate Brianza, Italy; Merck LC, Southampton, UK; Scriba Nanotecnologie, Bologna, Italy; Johnson Matthey, Reading, UK; BASF, Ludwigshafen, Germany; Innova, Rome, Italy; VDI/VDE, Berlin, Germany; Imperial College, London, UK. Coordinator of WP7 (training) and of the University of Bologna - INSTM Unit. Bologna-CNR 12M meeting Jan 18-20-2010.. The UNIBO group has organized the ONEP School in Erice in April 2010. EU FP7 Small Scale Collaborative Project Modelling of electronic processes at interfaces in organic-based electronic devices (MINOTOR) : CP-FP228424-2 (2009-May 2012) coordinated by Profs. J. Cornil, D. Beljonne, R. Lazzaroni, University of Mons-Hainaut – UMH, with University of Linköping (W.R. Salaneck, M. Fahlman) Sweden; University of Twente (M.P.de Jong, G.H.L.A. Brocks) The Netherlands; IMEC (P. Heremans) Belgium; University Bordeaux, (F. Castet) France; University of Bologna (C. Zannoni), Italy; Universitad Autonoma de Madrid (F. Flores), Spain; BASF (C. Lennartz) , Germany; Forschungszentrum Karlsruhe, (W. Wenzel) Germany; Georgia Institute of Technology, ( J.-L. Brédas) USA; Princeton University (A. Kahn) USA. India-Italy Bilateral ST MAE Materials Science & Technology project: Computer simulations and NMR investigations of responsive materials for photonics applications with Prof. V.S.S. Sastry, Dept. of Physics, University of Hyderabad (2012-2014) . EOARD - Awards to International Educational Institutions and Non-Profit Organizations"Air Force Office of Scientific Research, Air Force Material Command, USAF, grant FA8655-11-1-3046, Modelling ferroelectric nanoparticles in nematic liquid crystals (FERNANO) (1 Sep 2011 - 31 Aug. 2014 and Sep 2015-2018). Original web page by Stefano Zannoni (2000).